What was meant to be a crib session on how five-star hotels prefer foreign plonk over Indian wines, turned into an hour of discovery for Abhay Kewadkar. He leads the UB Group's wine division. 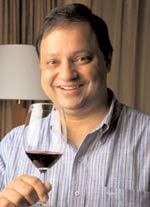 Kewadkar, a chemical engineer by training, is an old wine industry hand. We met over lunch to discuss the state of the wine business. We had randomly selected the Baluchi restaurant at The Lalit in Delhi, partially because we were curious to find out if it had recovered from the shock of being supremely mismanaged. An empty restaurant greeted us. This wasn't surprising. After ordering the non-vegetarian thali, we settled for the Four Seasons Shiraz 2009. Kewadkar had requested the more expensive Four Seasons Barrique Reserve, but it wasn't available at the time. Our first surprise was the thali; priced at `895 plus VAT. From the aloo gobhi to the fish tikka and dahi meat, there was nothing that couldn't be called excellent. It was good old-fashioned Punjabi food without frills-generously proportioned and lovingly cooked and served. The Shiraz was our next surprise. It seemed to have been created especially for the meal-medium bodied, fruit forward, yet with a gentle complexity, which, Kewadkar said, was because 30 per cent of the wine is aged in French oak barrels. Red wines can be hard to pair with North Indian meals because their tannins clash violently with the spice. Tannins are the compounds that help red wines age with grace. However, if a wine hasn't been allowed to mellow with time, the tannins can make it taste astringent, leaving one's mouth feeling completely dry. The tannins in the Four Seasons Shiraz were understated. Sadly, this also meant it couldn't be stashed away for more than two years. A good wine can make a good meal even better, but a bad wine can kill it. Some nights before my memorable Shiraz experience, I dined at Rara Avis, a great addition to Delhi's crowded dining out scene, with a particularly bad bottle of Sula's Viognier 2011. It's a white wine- actually, more a sweet sherbet-that I wouldn't even serve to an enemy. The yo-yoing quality of Sula wines is a matter of great concern. Are consumers paying for the company's struggle to balance production standards with the rising volumes? That, by the way, is the oldest challenge in the wine business and one very few have figured the way out of.